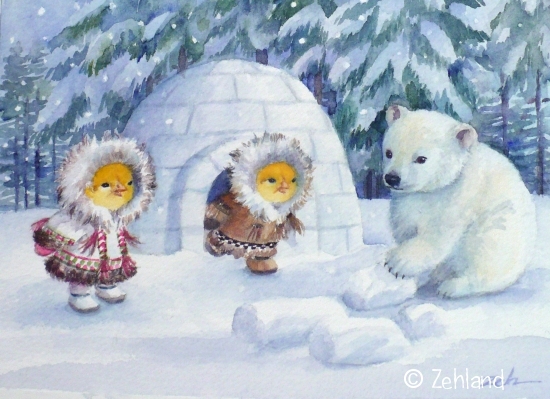 You know it's cold in Zehland when the polar bears come to visit. They appear out of the Far North in the deep of winter and stay only as long as the weather is frigid. Last week, the temperature was so low that it felt Arctic. So Ferdinand and Nina decided to build an igloo. They had studied all about the Arctic in school. 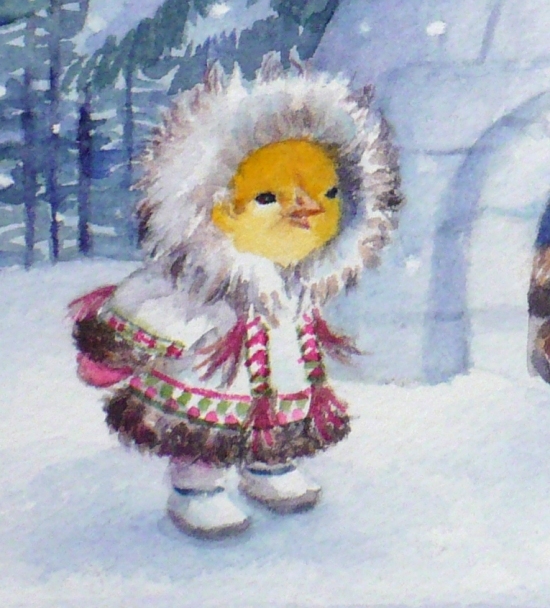 Ferdinand had done a presentation on how to build igloos for his project and Nina had made some native Inuit costumes for hers. So they felt prepared. 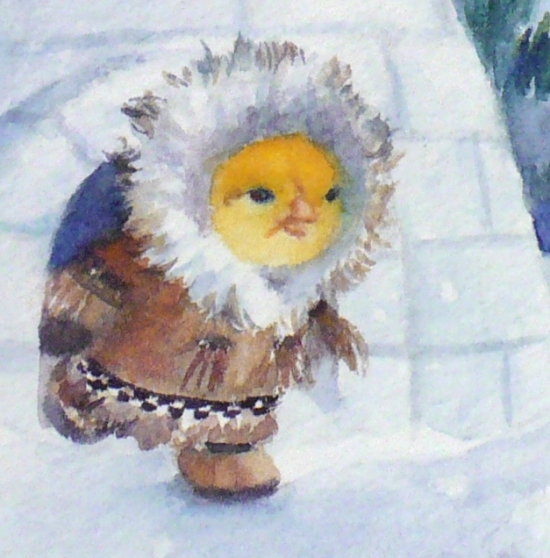 Nina pulled out her faux fur boots and parkas to keep them warm while they got to work. I don't know if you've ever built an igloo. It takes a lot of stamping to pack snow until it is very hard. Then it is a lot of work to chop it into blocks. But finally they had enough blocks made, and they stood gazing proudly at their accomplishment. "Now how do we put all these blocks together?" asked Nina. Hmm. They hadn't thought of that. Neither of them could lift the heavy pieces. 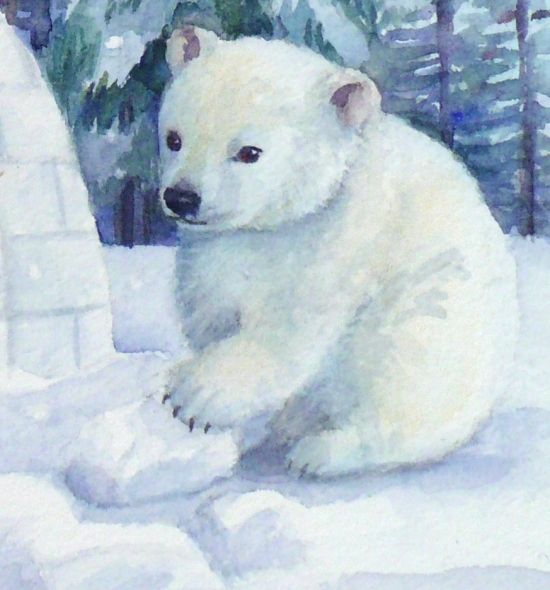 Perhaps the igloo would not have been built if not for a baby polar bear named Paddy who appeared at that very moment. Paddy was looking for something to do and was happy to use his strong paws to help. Under the direction of Ferdinand, he lifted each block into place until a nice round igloo appeared. Then they all packed the cracks with snow. Ferdinand rushed inside. It was sturdy and comfortable and big enough for two small chicks. But what about Paddy? Well, he is a Polar Bear after all, and polar bears love being out in the snow. He ambled away with a wave and a smile to look for more adventures. As for Ferdinand and Nina, they ran into and out of and climbed on top of and slid off of and in all ways enjoyed their new igloo. Put on your fur parka and join the fun!